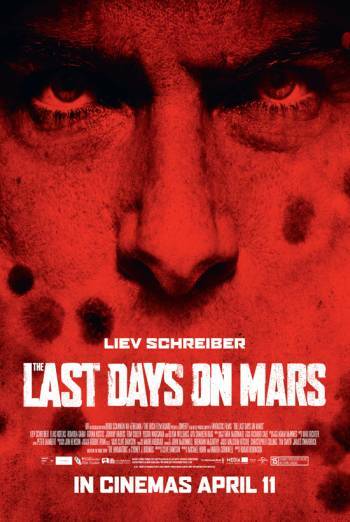 THE LAST DAYS ON MARS is a sci-fi horror drama about a small group of astronauts gathering specimens on Mars who come under attack from a deadly bacterial force. Scenes of strong bloody violence include astronauts defending themselves against their former colleagues who have been infected and have turned into killers. One infected man attacks another with an electric drill and we see it in his stomach, with some bloody injury detail. In another scene bloody injury is seen on a man's chest as a result of an attack, with a brief close up of the wound. In a later scene there is a fight between two men. The infected man tries to stab the other with a knife, with the blade going through the visor on a helmet. The man wearing the helmet delivers several head butts which leaves his opponent's face bloodied.